Meta Therm Furnace Pvt. Ltd offers tray ovens that are designed with enclosed insulated chambers. The heat is transferred by the circulation of hot air which is produced by the electric heaters. While the horizontal air provides uniform heating, the blower fans ensure proper circulation and transfer of the heat. The trays used in them can be rod type, heavy-duty steel tray or wire mesh type. Being one of the highly reputed Tray Oven Manufacturers In Mumbai, we offer these products in different specifications to our clients. If you are looking to have some specific features in these ovens, let us know and we will tailor it to your requirements. 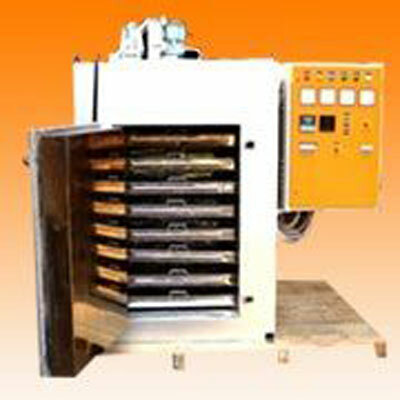 Our company is established as one of the most dependable Industrial Tray Oven Exporters and Suppliers In India. If you have any doubts regarding our Tray Drying Oven, call us immediately and our experts will clear them.